Bonhams is an auction house in the western world and they just sold a 1963 Lightweight E-Type Jaguar for – wait for it – 7.3 million dollars! Now, I like E-Types and have actually raced against Bob Jane’s lightweight E-Type in Australia, but I’m sorry, they are not worth 7.3 huge ones! What is interesting is the re-creation of six “new” E-Type lightweights by the factory. In the press release by Jaguar, they say that these Lightweight E-types are being meticulously built by specialist engineers, highlighting the capability and expert engineering skill set of the new Jaguar Classic Workshop. These coveted next generation ‘Special GT’ E-type cars were originally built in 1963 with new aluminium bodies to improve performance. But only 12 of the projected 18 were ever made. The six brand-new Lightweight E-types that now complete their number, fifty years later, will carry the original series chassis numbers of the ‘missing’ vehicles. The prototype of these new Lightweight E-types has already been made and undergone a 15-day shake-down period at Jaguar Land Rover’s test facility at Gaydon to prove out the car’s dynamics and establish optimum suspension settings. To create the new E-types, every single panel and part had to be minutely scanned and recreated before being assembled at the Browns Lane plant, just yards from where the originals were built. The core component of the Lightweight E-type is its aluminium bodyshell. This material replaced the steel of the production E-type in the quest to shed weight – some 114 kg were saved compared with the standard car. Despite the 50 year gap, the aluminium build of the six new Lightweights gives them an immediate affinity with the current Jaguar range, the XE, XJ and F-TYPE models being built to exacting standards with aluminium bodies for exactly the same reason. In fact, Jaguar is now the world’s leading manufacturer of aluminium-bodied cars and the company has unrivalled experience in the relatively new field of applying aluminium technology to volume production cars. The Lightweight E-type was powered by a highly developed version of Jaguar’s straight-six XK engine which, with its chain-driven twin overhead camshafts and aluminium head with hemispherical combustion chambers, remained highly advanced in 1963 even though it had first been seen in the XK 120 as far back as 1948. It was this engine that had powered the C- and D-types to five Le Mans victories in the 1950s. A race winner in its own right during its short competitive career, the Lightweight E-type has achieved worldwide fame and is highly coveted. 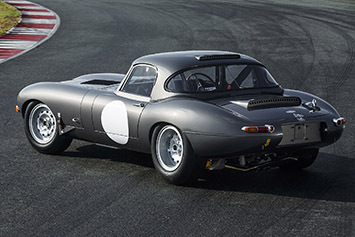 The six new Lightweight E-types are competition vehicles with FIA homologation for historic motorsport purposes.